On November 26, Wish 107.5 is slated to premiere the second installment of its own online singing competition, Wishcovery. On its sophomore season, the show is putting the spotlight not only on the Wishcoverees or the singing talents it gathered across the archipelago — seven seasoned songwriters will also take centerstage as they helm and coach their respective camps of contenders. Weeks before the season premiere, these distinguished industry figures have traveled to different provinces and have initially hand-picked their camp members through a rigid series of screening processes. Before the big reveal of who made it to their camps, get to know first the composers-Wishcoverers of Wishcovery Season 2: The Singer and The Song. Back in the ‘90s, Boy Christopher Ramos has collaborated with Willy Garte and Joel Lagartija for the ubiquitous, eye-opening hit “Bawal Na Gamot.” Following the smash single, he continued to pursue weaving words and melodies, and focused on tunes that inspire and touch the hearts. His name again made quite the buzz back in 2011 when his original composition “Ito Ang Buhay Ko” won the Best Theme Song tilt at the prestigious Asian Television Awards. The said piece was the official soundtrack of the TV5 program titled Star Confessions (now Real Confessions). He scored another accolade as his worship song “Ikaw,” interpreted by belter Jona, bagged the top prize during the second season of A Song of Praise Music Festival in 2013. From getting exposed to the hip-hop culture of Los Angeles during his teenage years to working with big names in the OPM scene since the ‘90s, Jungee Marcelo has secured his status as one of the most respected figures in the local music industry. Marcelo is the hitmaker behind Gary Valenciano’s “Hataw Na,” Zia Quizon’s “Ako Na Lang,” Morissette’s “Diamante,” and KZ Tandingan’s “Labo.” However, this award-winning multi-hyphenate does more than just writing, arranging, and producing incredibly infectious songs — he is also a dancer, choreographer, and a host. Moy Ortiz is a man who wears many hats. He is a founding member of the The Company — hailed as the country’s premier vocal ensemble — and currently sits as its artistic director, musical director, composer, and vocal arranger. Together with the group, he has released 24 studio albums, garnered 46 music industry awards, and worked with international acts like Jim Brickman, John Ford Coley, and David Pomeranz. Showing no sign of slowing down, Cabangon still actively records album; his most recent project is “Byahe Pa Rin” — the third installment of his well-received “Byahe” album series. The acclaimed Filipino troubadour is also a fixture in the local concert scene. Rannie Raymundo is a singer, a songwriter, an arranger, a multi-instrumentalist, an actor, and a published author. The former high school student who was once a member of the renowned Kundirana (an all-male glee club of La Salle Greenhills, where Ogie Alcasid, Louie Ocampo, and Randy Santiago have all been a part of) has indeed grown to become one of the most talented artists the Philippine music industry has seen. He is widely known for the classics “Why Can’t It Be,” “Noon, Ngayon,” and “Ang Awit Mo,” among others. Together with Renz Verano, Chad Borja and Richard Reynoso, he is also part of the group OPM Hitmen. Top Suzara is best remembered as one of the vocalists and main songwriters of ‘90s pop/soul/R&B group Freestyle. Before he pursued a solo career back in 2006, he and the gang have dominated the radio, music charts, and the live gig circuit with hits such as “So Slow,” “Before I Let You Go,” and their take on “Bakit Ngayon Ka Lang?”. When he called it quits with the band, he went on to write his own songs which would eventually be a part of his debut solo album, “Carry On.” The effort features all-original compositions including the smash hit “Sabihin Mo Na” and the moving “Angel Eyes,” which he dedicates to his late parents. From humbly working for a photocopying company, Vehnee Saturno found fame with his victorious stint at the Metro Manila Popular Music Festival or Metropop. Since he won the grand prize in 1982 with his entry “Isang Dakot,” his songwriting career has continued to prosper and produce some of the most timeless OPM tunes. Saturno, recognized for his unparalleled flair for crafting sentimental pop and ballad tracks, is the musical genius behind Martin Nievera’s “Be My Lady” (his first major hit), Jaya’s “Dahil Tanging Ikaw,” Sarah Geronimo’s “Forever’s Not Enough,” Jay R’s “Bakit Pa Ba?,” and Kris Lawrence’s “Kung Malaya Lang Ako,” among many others. Catch these seasoned composer-Wishcoverers as they guide, mentor, and bring out the best in their hand-picked Wishcoverees! 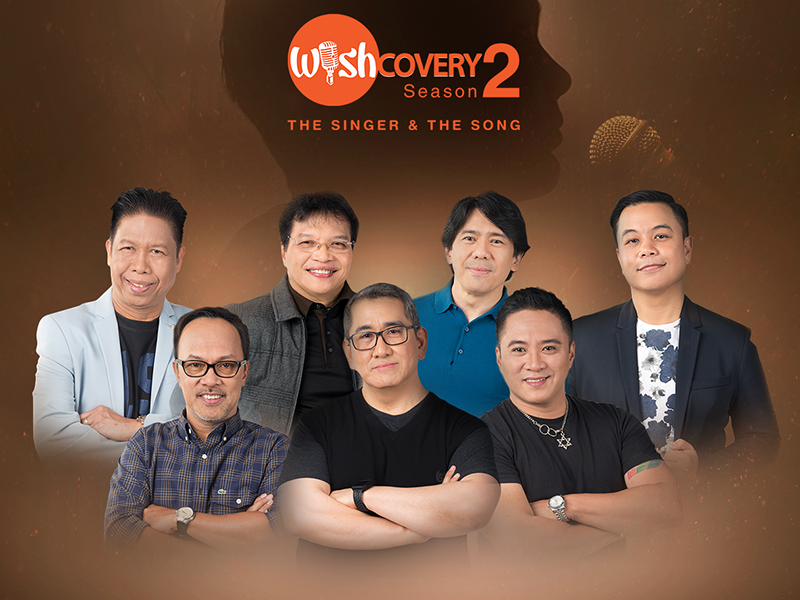 “Wishcovery Season 2: The Singer and The Song” airs daily on the Wish 107.5 YouTube channel starting Monday, November 26, at 9:30 p.m. PHT! ERRATUM: This article has been updated on November 17 to reflect the change on the date of Wishcovery Season 2 premiere. The new schedule has been moved from November 19 to November 26, Monday.